At Aladdin Doors®, we're passionate about satisfying our customers, growing our business, making money and having fun—and we're not alone. The garage door has become a hot new design statement for American homeowners who want the latest in style, safety, and high-tech function. We sell more than just garage door products and services; we focus on three key characteristics of running an effective business: "Fun, Excitement and Imagination." 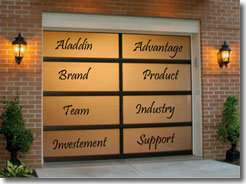 The Aladdin Doors® business model is easy to learn, manage and grow. We believe that working with franchise owners, and providing ongoing training and support will play a major role in the system's growth. The doors that an Aladdin Doors® franchise can open are virtually limitless. Become a contributing member of your community. Create an opportunity for your family members to work in a business that you can pass on to them in the future. Own a high potential revenue business with a low investment cost. Have the freedom and flexibility to enjoy a lifestyle outside of work. Next Feel the satisfaction and pride that come with business ownership. At Aladdin Doors®, we are looking for motivated business candidates that willing to do what it takes to build a successful business franchise as a mean of achieving their goals. If you are ready to take charge for your future, let's talk about whether we are a good fit for each other, your willingness to do what it takes to grow your business, and our commitment to do what it takes to help you grow. Let Aladdin Doors® grant your wish for a new career direction! Click on Request Information for FREE info on how to open a Aladdin Doors franchise today! Please Note: This Aladdin Doors franchise opportunity and other franchise business opportunities, businesses and franchises for sale on this web site are not to be considered as an "offering", "franchise offering", suggestion or recommendation by Franchise Leader™. This advertisement depends entirely on the truthfulness of the information provided by our advertisers which includes, but is not limited to, franchisers, franchise brokers, franchise consultants and business brokers. Franchise Leader™ recommends that you consult a lawyer, financial consultant, accountant or professional advisor before buying a franchise or business opportunity or any type of business. By using this form or any part of our website, you have agreed to all terms and conditions of Franchise Leader™. Please review our Terms & Conditions for more information.